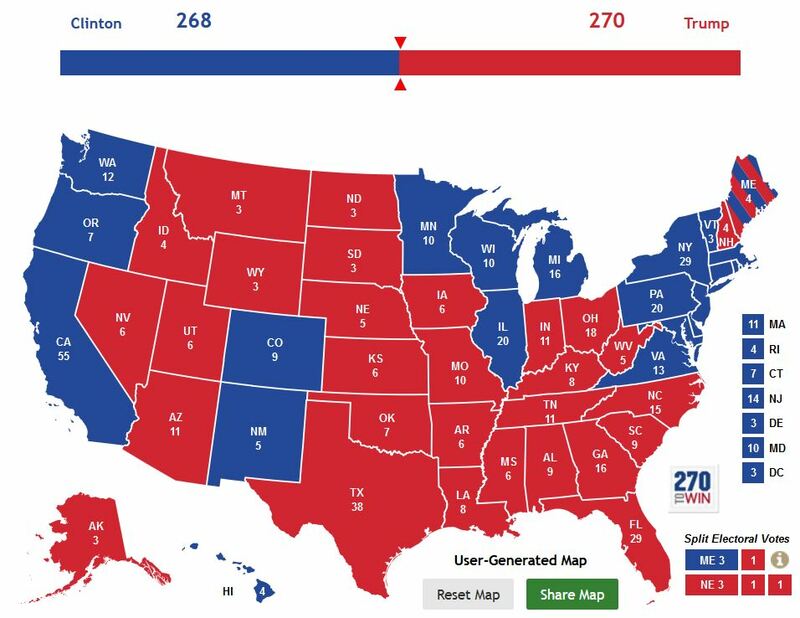 ELECTION DAY 2016 … With Many Polls & Pundits Saying Otherwise … Trump Does have a Plausible Path to 270 and Victory or What If a Tie? 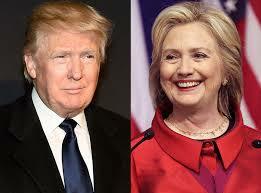 Even though many of the poll as seen at RCP have Hillary Clinton ahead in the national polls. The averaging of polls have Clinton ahead by 3.2%. However, national polls mean little to nothing, its about the states and enthusiasm. Donald Trump does have a pathway to victory and its not that far-fetched. I am not going to lie, will it be easy, no. Is he the underdog right now, the answer is yes and maybe. Many polls are within the margin of error, which means they could go either way. One thing is for certain in a political season where there have been no certainties … no political pundits have been correct on Trump yet, why should they be now? Here is the current RCP Map of the electoral college of states between Clinton and Trump with 203 for Clinton/Kaine, Toss Ups 171 and Trump/Pence with 164. 270 is the magical number. 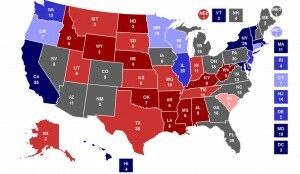 The toss up states are as follows”: Florida (29), Ohio (18), Michigan (16), Pennsylvania (20), New Hampshire (4), Maine CD2 (1), Maine (2), North Carolina (15), Virginia (13), Georgia (16), Colorado (9), Nevada (6), New Mexico (5), Arizona (11) and Iowa (6). Now check this out and see if this is not a plausible possibility of what could happen today? According to may of the average of polls, this is highly possible. If this happens, the race is 269 – 269, a tie!!! It is possible the election could be a tie and its not that far out of the realm of possibility. We will put the following states in the Trump camp: Florida (29), Ohio (18), New Hampshire (4), North Carolina (15), Georgia (16), Nevada (6), Arizona (11) and Iowa (6). What happens if it is a tie, what is the Tiebreaker? In the event that neither candidate gets the majority of the vote, the House of Representatives would decide the president, Congress is still bound by the electoral vote. So basically this means the following, if Democratic candidate Hillary Clinton and Republican candidate Donald Trump each have 269 electoral votes, then the current House of Representatives must choose one of them. Because Republicans hold a majority in “current” Congress, Donald Trump would very likely be chosen. If neither candidate gets a majority of votes, then third-party candidates come into play, if they can earn electoral votes. The 12th Amendment subsequently limited Congress to choosing among the top three candidates. 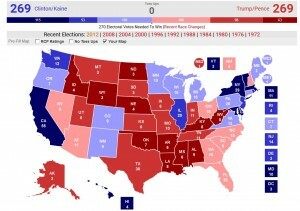 But if we move the map by just one state race where in Maine CD2 (1) swings to Donald Trump, he wins 270 to 268. The point that I am trying to make is, its possible. Is there a pathway to victory for Trump, of course there is. Is there would for Hillary, yes there is as well and it is much easier. In a year in which the Chicago Cubs finally won a World Series and ended a 108-year wait, anything is possible. 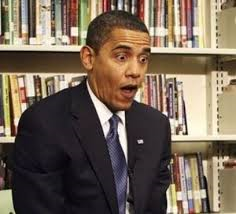 We will know early on as to how the races are going in New Hampshire, Maine, Georgia and Pennsylvania as to what the election day trend is, will America put up with another 4 years of Obama and a corrupt candidate like Hillary Clinton, or will Donald Trump shock the world? For the first time the Real Clear Politics average of national polls shows Donald Trump up 0.4 points over Hillary Clinton. The score is Trump 44.0, Clinton 43.6. This erases a 20 point lead that Hillary had back in July 2015. And more recently, an 11 point lead Hillary had over Trump in March 23, 2016. It is obvious that Trump is surging and trending up, while Hillary is falling. This has to bring panic to Team Hillary and the DNC as Trump is solidifying support behind him while the Democrats become more and more divided and violent as Bernie Sanders vows to fight on to the convention. So MSM, which party is having a civil war again? The polls in play that show either Trump surging into the lead or making up a great deal of ground on the struggling Hillary Clinton are as follows. Imagine a government forcing people to accept something that the majority of them don’t even want. In fact, what if 38.9% were in favor and 53.6% were against, or a -14.7% average of people were against what a government had forced on its people. Are we referring to Putin, Russia and Crimea? Hardly, we are talking about Barack Obama, Democrats and Obamacare. How bad is it when we can compare what Russia does to it’s citizens to that what those in power in America does to theirs? Putin – “Yes, in Russia we have word for this … Obamacare“. President Barack Obama’s poll numbers are in free-fall. A recent Quinnipiac University poll has Barack Obama’s job approval hitting an all time low of 39%. Also, For the first time in his presidency American voters say by a 52% to 44% that Barack Obama is not honest and trustworthy. Gee America, what took you so long, but welcome aboard? American voters disapprove 54 – 39 percent of the job President Barack Obama is doing, his lowest approval rating in any Quinnipiac University national poll since he became president, as even women disapprove 51 – 40 percent, according to a national poll released today. Today’s results compare to a slight 49 – 45 percent disapproval October 1. President Obama’s lowest score before today was a 55 – 41 percent disapproval in an October 6, 2011 survey by the independent Quinnipiac (KWIN-uh-pe-ack) University. Today, disapproval is 58 – 37 percent among men, 91 – 6 percent among Republicans and 63 – 30 percent among independent voters. Democrats approve 79 – 14 percent. White voters disapprove 62 – 32 percent while black voters approve 75 – 15 percent and Hispanic voters disapprove by a slim 47 – 41 percent margin. Gallup poll also has bad new for Obama and his minions. According to the Gallup poll, Barack Obama has taken a hit on the characteristics and qualities of a president like a decisive leader and being honest and trustworthy. So Obama isn’t a decisive leader, he is not considered honest and trustworthy and he has no clear plan for solving America’s problems … why is he president again? President Barack Obama’s reputation with the American public has faltered in some ways, but not in others. Most notably, for the first time in his presidency, fewer than half of Americans, 47%, say Obama is a “strong and decisive leader,” down six percentage points since September. Similarly, the share of Americans who view Obama as “honest and trustworthy” has dipped five points. Exactly half of Americans still consider Obama honest and trustworthy, but this is down from 55% in September and 60% in mid-2012 as Obama was heading toward re-election. Have you seen Barack Obama’s average polling lately? Polls with him in the 30′s is not the outlier but the norm. 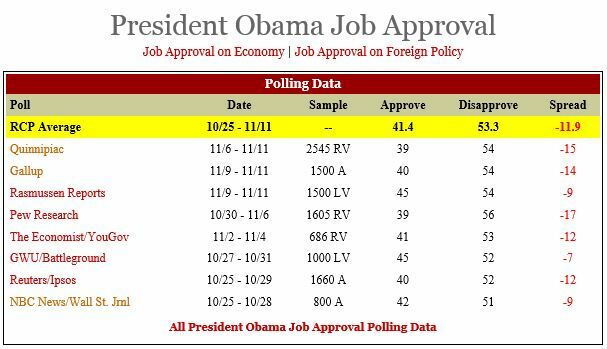 From Real Clear Politics comes the following terrible polling for Barack Obama.